I'm sure the question on your minds is: WHAT happened??? Those of you who are friends with us on Twitter are already filled in. Saturday afternoon -- after a lazy brunch out at a new diner with our neighbors; talk of childcare costs (for them, not us), bills, and taxes; and realizing those taxes are due, like, soon -- we scrambled to get all our W2s and other important documents together. We also got our mail. Oh, yes. It wouldn't be a Saturday afternoon unless we received a visit from the bill fairy. This particular bill was from our mortgage company. Our escrow balance, specifically. (And escrow account is the account, at least in our case, established by our mortgage broken for paying things like our insurance and taxes all in one convenient place.) So, let's talk numbers. I noticed our escrow amount was less this year than it was last -- maybe by 65 dollars each month -- it never really made sense to me, but we decided to not ask questions. We're new homeowners after all, this is probably a normal adjustment. WRONG. And this bill was our notice that we owed $1,300 to the bank. In April! As in 2010. That's a lot of money!!! Not only that . . . our monthly escrow payments had shot up nearly $350 a month. This meant our total monthly mortgage and escrow was WAY over what we'd signed up for in June 2008. We both freaked out. Called our parents -- both sets of which we couldn't reach -- and then did a bit of Google searching. That was mistake number 2. I kept finding information about how escrows can shoot up depending on a number of factors. Local and county tax increases. New property assessments. Other adjustments from year to year. Really, a number of things. So, we figured they were probably just right. They're the bank, and it's their job to tell us how much we owe them. They're professionals and wouldn't have sent us an entire year's worth of monthly payment stubs stating this new -- and however outrageous -- amount in bold print unless it was correct. Nope. After we got our heads on straight, I started actually LOOKING at the bill. Adding up the amounts they provided that made up the astronomical new number. I noticed that the math was wrong . . . and that, for example, they had charged us double city and county tax. That was weird. OK. Then I saw they were charging us for THREE school taxes. And we only had documentation with one of those amounts. Hmmm. To make matters worse, it was Saturday on a long holiday weekend . . . so we couldn't reach a representative to put our minds at ease until Tuesday! So we waited. I wrote bullet points of all the things I found wrong with their document. And yesterday Stephen called them. After a long hour on the phone, the bank realized their "computer" made an error and charged us way more than we actually owe. Our escrow shortage is more to the tune of $350, which makes much more sense to me. And our monthly payment is only going up by $90 a month. This all makes sense, and the newly adjusted numbers accord with what we originally agreed to at our closing. All put together, that initial $5,500 number that we would have owed over the course of a year turned into $1,430. Nothing much. Just a $4,070 mistake. Several lavish vacations. Four 50-inch plasma screen TVs. A couple MacBook Pros. A big chunk-o-savings. You know, no biggie. 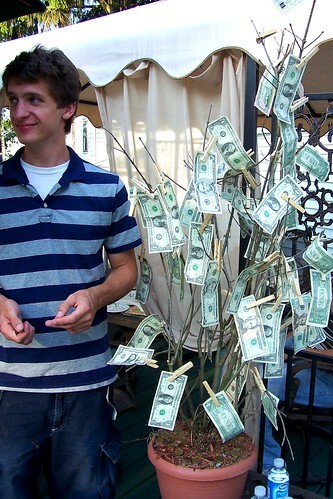 Unless you're my brother (above), I haven't seen money grow on trees for me. So, here's why you, too, should carefully read your bills. MISTAKES: If the story above isn't compelling enough for you, consider this . . . Billing mistakes happen more frequently than we'd like to think. More times than not, it's computer error, and I'm sure you've seen enough of those first-hand to know this is true. And if you go ahead and pay the bill and find out LATER that it was a mistake, you'll have a much harder time disputing the issue. CHANGES: Again, we're not great at paying bills. I'd been writing my checks to my old lender and hadn't noticed that my school loan company went under new direction. Though I hadn't heard anything bad about this from my lender . . . it's certainly important to put the right name on the check. But changes can include a number of other issues, including to terms and conditions, that might even impact your amount owed. Read the fine print, folks! RANDOM AND FRAUDULENT CHARGES: This one's more for reading your bank statement. But a few months ago, I noticed that we were having about $20 taken out of our account each month for some weird company. Furthermore, I had no idea what product or service we were receiving from said company. When I called, they said that Stephen had signed on for some trial offer of something while shopping online (which he doesn't remember doing -- but sometimes those offers are TRICKY -- so be careful). Anyway, it took us a couple months to catch this small charge. And it took a heck of a lot more effort to remedy the situation. So catch problems early, and we hope you have good luck. It does happen, even if you think you're being careful. DUE DATES: This hasn't happened to us personally . . . but we've heard from our friends that a company changed due dates on them, and then they accrued all these late payment charges -- without even knowing it. I can't stress enough: You must read your bills carefully. And this includes all those that are automatically deducted from your account online. Convenient. Paperless. Dangerous. Those are sometimes the worst because you set a payment schedule and forget about it. UN-NECESSITIES: You may be paying for stuff you don't even want or need anymore. Like magazine subscriptions or other things you've set to automatically renew each year that you're just no longer using. So trim the fat, and you'll be happy you did. Maybe find a new use for the cash . . . or just save it. We're bad at that, too. If all this money-talk is stressing you out, go check out our first yoga-centric post. And maybe take the heat off and make yourself some no-bake chocolate-mint "cupcakes" . . .